Kurt V. Jahrling, BCO, BADO, FASO attended Western New England College and received his Bachelor of Science (BS) in Biology in 1983. He began his ocularist apprenticeship in June 1983 and became an American Society of Ocularists (ASO) Board Approved Diplomate Ocularist (BADO), and a National Examining Board of Ocularists (NEBO) Board Certified Ocularist (BCO) in 1989. In 2011 he became a Fellow-American Society of Ocularists (FASO). He is currently on the board of NEBO. He has lectured often to fellow ocularists at the ASO meetings and to eye residents at the area hospitals in Boston and Providence. This would include three presentations at the Joint Meetings of the ASO and AAO. (Refer to Publications) He is also a member of Toastmasters International. 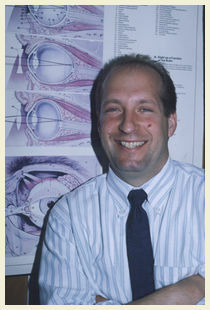 Since 1996, he has traveled weekly to our Providence, RI satellite office, and annually to München, Germany for consultations on the fabrication of plastic eyes at the Greiner Institut für Künstliche Augen.